The Weekly Standard Blog has been leading the charge to find the truth behind the disgusting anti-military hit pieces at The New Republic. Our Soldiers our held to the highest standards in all regards to include Standards of Conduct and Rules of War. There has been no operational reporting of the misconduct of Soldiers as reported in the article. We also cannot disclose the names and units of Soldiers that are serving in Iraq. In addition, any misconduct by Soldiers is addressed by the unit commander through the uniform code of military justice. All violations of the law are investigated. So, does this statement by MNF-I confirm that the stories are BS? Little Green Footballs, which did so much to debunk the “Fake but Accurate” 60 Minutes story. The Tank, which smelled something fishy with this even before the WWS. …Make it nearly certain that the articles in question at The New Republic are not accurate. IT IS ALL A LEFTIST SHAM. 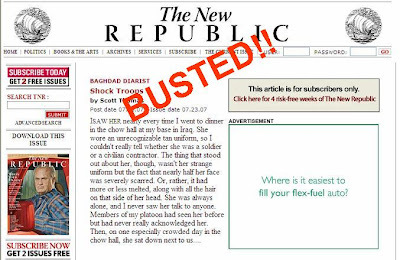 Busted!… New Republic’s “Shock Troops” Shocker Is BOGUS! Related… Michelle Malkin has more on the military-hating Left in this country. William Kristol wrote more on the liberal’s soldier hatred this past weekend. I can tell you unequivocally: there was NO mass grave discovered in this area of operations in conjunction with the building of a coalition outpost anytime in the past 12 months. None. Zero. Zip. If the story *is* true, then “Scott” and whomever else is purporting to back up his assertions should come forward, identify themselves and submit their report through official channels. We are not in the business of suppressing his right to free speech…on the contrary- he’s free to submit whatever he wants, so long as it doesn’t put others at risk for operational security (OPSEC). Of course- by putting his name on such outlandish claims, he then has to account for what is clearly a series of false statements. That about says it right there. The New Republic needs to come clean! UPDATE 3: A Jacksonian points out again that JD Johannes has narrowed it down to 100 soldiers who “may” have written these atrocious articles.